Istanbul is the only city in the world to be built on two continents. There is no doubt that the presence of the “Asian side” beyond the Bosphorus appeals powerfully to the European collective imagination. Sometimes this prerogative may give rise to strange doubts and unrealistic expectations. Unrealistic expectations can be, instead, glimpsed on the faces of groups of tourists that we happen to see every now and then getting off from the ferry at Üsküdar. The eyes and ears which have imagined to savour the East collide with chaotic traffic and the huge construction site of the Marmaray Tünel. Few minutes later some even get back on the same ferry to return to Sultanahmet, sadly bewildered and disappointed. The reality of Istanbul is very complex; we will never be tired of reminding it. The city is a collection of many cities, the architectural landscape and the social context change quickly and radically, within a few feet and/or a few months. It is enough to just move a few meters from Taksim to Kasımpaşa or from Sultanahmet to Kadırga to bump into very different realities. It is thus not necessary to cross the Bosphorus to search for the more oriental, the more Muslim, the poorer and the truest part (?). These classifications are meaningless in Istanbul. In the European as in the Asian side there are more conservative districts (Fatih and Ümraniye) and more modern ones (Beyoğlu and Kadıköy), areas full of history (Sultanahmet and Üsküdar) and areas voted to shopping (Nisantasi and Bağdat Caddesi), neighbourhoods with an interesting religious mixture (Fener /Balat and Kuzguncuk /Yeldeğirmeni) and pretty villages on the Bosphorus (Arnavutköy and Çengelköy). Our advice is, therefore, to give a chance to the Asian side, without preconceptions and in a more informed manner. For a long time we have received requests from people really curious about this part of the city. However, we were intimidated by the thought of how to enclose in a few hours its major points of interest, especially because we did not know what the latter were exactly, given that no printed travel guide speaks extensively of these zones (indeed they are often excluded even from the map). For this reason, from March 2012 we have studied and put into practice an itinerary which includes the three most representative quarters of the Asian side of Istanbul (Kuzguncuk, Üsküdar and Kadıköy), providing within 5-6 hours a view as comprehensive as possible of the area, showing its historical, social and artistic complexity. The experience gained through the itinerary already existing, of Fatih, Fener and Balat, by now operative for two years and for which we keep receiving hundreds of positive comments and emails of gratitude, has pushed and motivated us to create this new tour, which offers a more complete and less stereotypical image of the beautiful city we live in. Üsküdar is one of the oldest districts of the Ottoman Istanbul; a residential district from the start as it continues to be nowadays. There are more than 180 mosques in the district. Some of them date back to before the Ottoman conquest, thus, among the oldest ones in Istanbul. The largest mosques are those of Mihrimah and Yeni Valide, while the most interesting are the smaller ones, Şemsi Pasha, Kaptan Paşa, Çinili. The history of Üsküdar has its roots well back in time, long before the Ottoman conquest in the 14th century and also the founding of the city of Byzantium by Greek settlers in the 7th century B.C. During the excavations for the Bosphorus tunnel were in fact found many ruins of the ancient Chrysopolis. 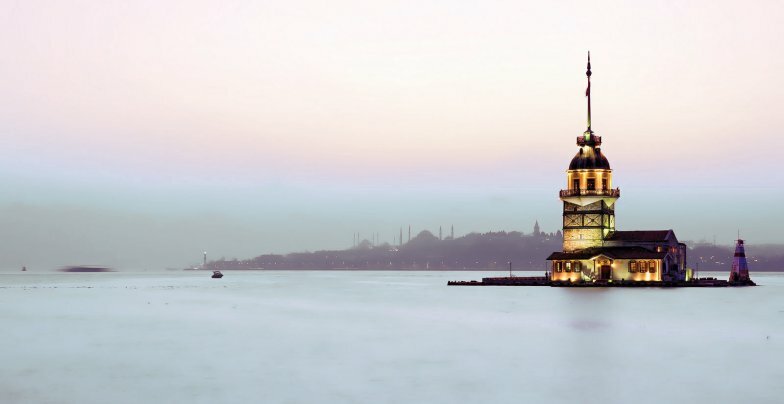 Besides the historical importance of the mosques and the beauty of the district in itself, one must indubitably take a walk to Salacak and arrive in front of the Kız Kulesi, a legendary tower which stands on an islet situated where the Bosphorus and the Marmara Sea finally meet. The Kiz Kulesi with the historical peninsula as background delivers one of the most striking spectacles of Istanbul. Not far from Üsküdar is Kuzguncuk, a neighbourhood inhabited since the early 16th century by the Jewish population, which later also welcomed Greeks and Armenians. Kuzguncuk is absolutely one of our favorite spots: it is basically a long and narrow valley, with both sides descending steeply to the Bosphorus. The placidity transmitted by its old wooden houses and the green of its plane trees makes this neighbourhood a really special place. It is only here that one can see a mosque next to an Armenian church and a synagogue side by side with an Orthodox church. It is no exaggeration to take this small neighbourhood as a symbol of the tolerance and harmony present in the Istanbul of the Ottoman Empire. Kuzguncuk also still preserves the atmosphere of a fishing village, a place for the soul that has inspired and continues to inspire artists, poets, filmmakers, architects and dreamers. Its points of interest are many: the synagogue of Beth Yakov, the Orthodox church of Ayios Panteleimon and the Armenian one of Surp Krikor Lusavoriç, not to mention the beautiful Fethi Paşa Park which offers fascinating views of the Bosphorus. The last area that our Asian itinerary touches is Kadıköy, the ancient and famous Chalcedon, founded actually 20 years before Byzantium by Greek settlers from Megara. Kadıköy’s very ancient history remains in the background of what is now in effect one of the most modern and lively districts of Istanbul. From the beginning of the 19th century that which in the Ottoman era was just a residential area for wealthy nobles turns, thanks to the construction of the Haydarpaşa Train Station, in a neighbourhood extremely diverse in terms of ethnic identities and social groups. At the beginning of the 20th century the population of the district was made up of Jews, Greeks, Armenians, Albanians, Bulgarians, Persians, Italians, Germans and French. 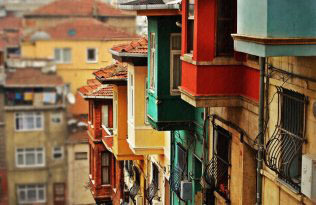 It is in this district that the first modern “apartments” made of stone and marble were built in Istanbul. A walk through the suburb of Yeldeğirmeni will hence bring us back to mind a period not long ago when German engineers and Italian stonemasons worked together, both as immigrants, in the cosmopolitan Istanbul of the early 20th century. Kadıköy is a modern district, considerable in size and densely populated (more than half a million inhabitants), with a great variety of atmospheres and architectural styles. A longer tour would lead you up to Bagdat Caddesi, a 14 km boulevard along the Marmara Sea, dotted with malls and shops of the most famous international brands. If one substitutes the plane trees with palms, it would really seem to be in Los Angeles. However, it is in the centre of Kadıköy that we recommend travelers to spend a few pleasant hours. The Central Market is one of the most interesting and picturesque of the city, is a very suitable place for a mini-culinary tour. Among the many kiosks there are countless specialties to try, which each retailer will let you taste with a smile on his face. Either lovers of savouries and sweets will be satisfied: in fact, it is here that they will find some of the most historic and famous pastry shops. A trip to Istanbul without visiting the Asian side would definitely leave a sense of incompleteness; however, it could be even more disappointing if one will arrive on the Asian side with the wrong expectations. We, therefore, hope that this article has provided the traveler with a clearer picture of an area of the city so important, although so often overlooked by the printed travel guides. We started 5 years ago to make guided tours with italian groups and you can read hundreds of feedback on our italian version of the blog and on tripadvisor. Now we can do it also in english! We made a fantastic tour of the Eastern/Asiatic side of Istanbul, we’ve been introduced in a few steps into life, atmosfhere, religion, food… everything!! Ambra was fantastic, passionate and happy to share all the things she knows!!! I do suggest to take this tour during your first days, through the knowledge received during the 5 hours walk, you’ll be able to better explore this Amazing city.